With the 2009 Tour de France gearing up for its start on Saturday I can’t help but question—beyond lodging, food, and transportation for all of the teams, media, organizers, and fans—what the language logistics of the race must be like. Since its beginning in 1903, the Tour de France has been internationally recognized as one of the most challenging sports events in the word, both physically and emotionally. This year the twenty-one stage race will cover 3,500 kilometers in France, Monaco, Spain and Germany between July 4 and July 26 and will feature intense mountain climbs, a fast-paced peloton, hairpin curves, and, as always, spectacular, if not dangerous, crashes. Nine countries are represented by the twenty teams competing—Belgium, Denmark, France, Germany, Great Britain, Italy, Spain, Netherlands, the United States—and, while I’m too lazy to count up the nationalities of all the riders, at least twenty-five nations are represented by the individual riders. While many of these countries are located in Europe, not all are. Last year Australia, the United States, South Africa, Columbia, and Kazakhstan all contributed riders to the race, and these statistics are just for the riders. Imagine how many nationalities and people groups are represented by the coaches, trainers, fans, sports announcers, tv crews, and crepe-makers. Not to mention that the race course itself spans three different languages in its route. Who needs the Olympics when you have the Tour de France? One of the more interesting outliers in this language amalgamation is the Boulder, Colorado-based Team Garmin-Slipstream. 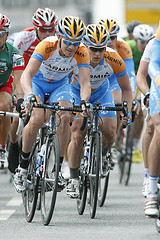 2009 marks the first year that any team has been comprised of only English-speaking riders, and Team Garmin-Slipstream’s roster includes four Americans, two Englishmen, a New Zealander, a Canadian, and an Irishman. Now, it’s not that Garmin-Slipstream tried to have only English-speaking riders (Dutchman Martijn Maaskant is first reserve) in the 2009 race, but given the fact that it is, I would assume that communication isn’t an issue between coaches and riders. This team might have something going for them. At the moment I’m unable to find any information about official Tour de France translators or translation issues the race has encountered, but I am searching for some because I find it impossible to believe that a race representing this many nations and languages does not have either several official translators or several major translation snafus. Certainly the media outlets dilute many of these issues by broadcasting in specific target languages to their viewership, but how do race organizers handle the crowds at finish and starting lines? How are real-time, in-person issues dealt with at the race? Is the official Tour de France language French, or logically, does it include at least English, German, and Spanish? And what is the hiring process for these announcers/organizers? I realize I’m raising more questions than I’m answering, but if anyone has some ideas/thoughts/answers, I’d love to hear them. I watched the start in Pforzheim, Germany in 2005. The city was packed and all the streets had rails keeping people off of the race course and on the sidewalks. There were grandstands at the official start and moderators with big screen monitors rambling in German. I took a spot a short distance from the start but right on the rails on a street corner hoping the riders would slow down as they passed. There is a grand parade of decorated sponsor cars, trucks and motorcycles that begin the race and you can collect quite a pile of goodies as they zoom by. This parade goes on for at least 10 minutes and maybe 100 vehicles. That turned out to be the highlight of the event for me. I did see the pack of riders pass just inches away and even got a photo of Lance next to his grand German rival Ulrich but that was all over in less than 5 seconds. It was well worth the drive to see it. As far as translation goes, the language spoken there was fun and everyone got it! I will be shouting Go Lance Go again this year!